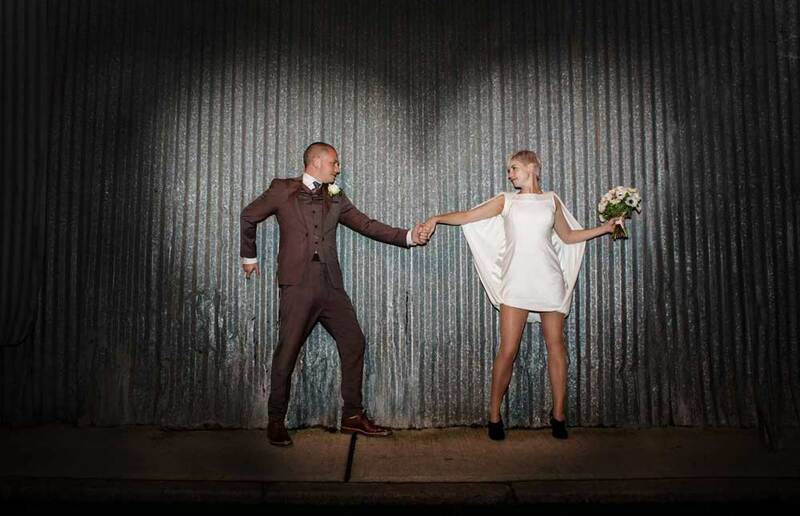 Every wedding is special, individual and memorable, even in the same venues. 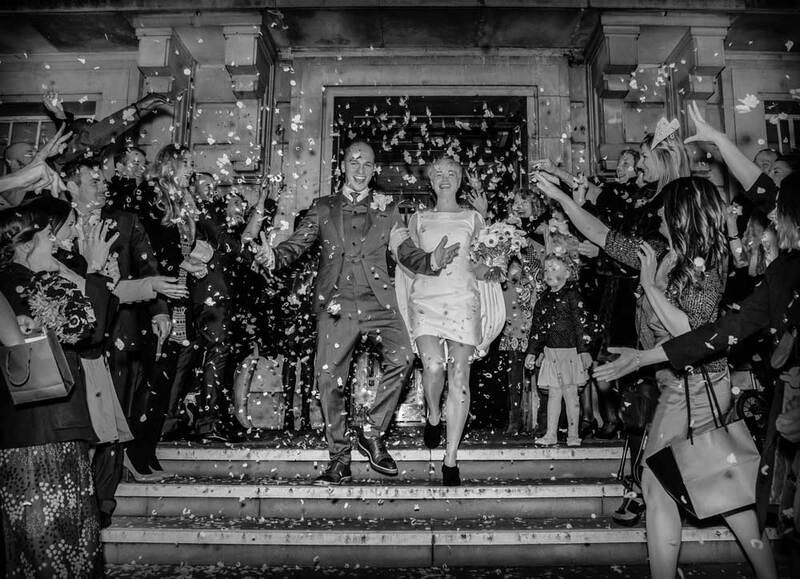 For instance last weekend in Bloomsbury Square London, there was so much love in the air especially between the couple during their ceremony I found myself fighting back the tears, which is just as well as I didn’t want to fog up the viewfinder! 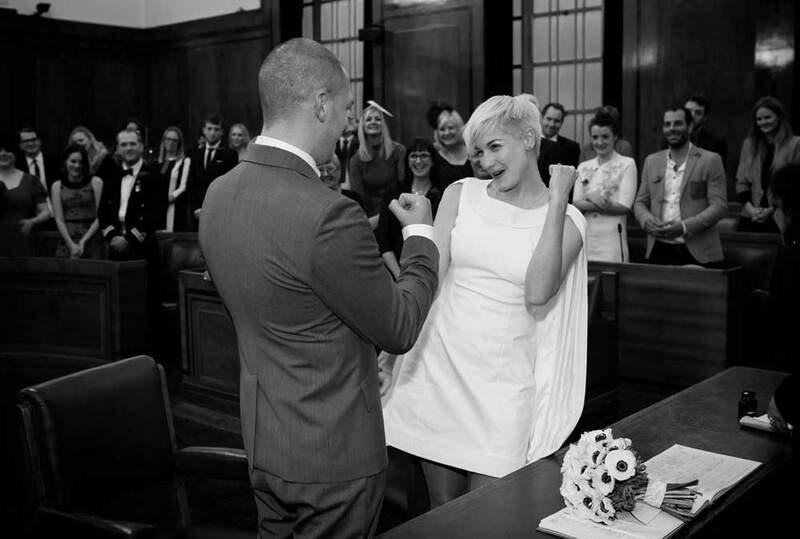 Carly and Jim’s Hackney and Hoxton London wedding was especially memorable, not just for the obvious love between themselves and for their friends and family, but for the individual stamp they put on their special day. Not to mention the lateness of the ceremony and celebrations. Photographing in the dark..no problem. The evening started with Carly arriving with dad in a specially prepped white london cab. 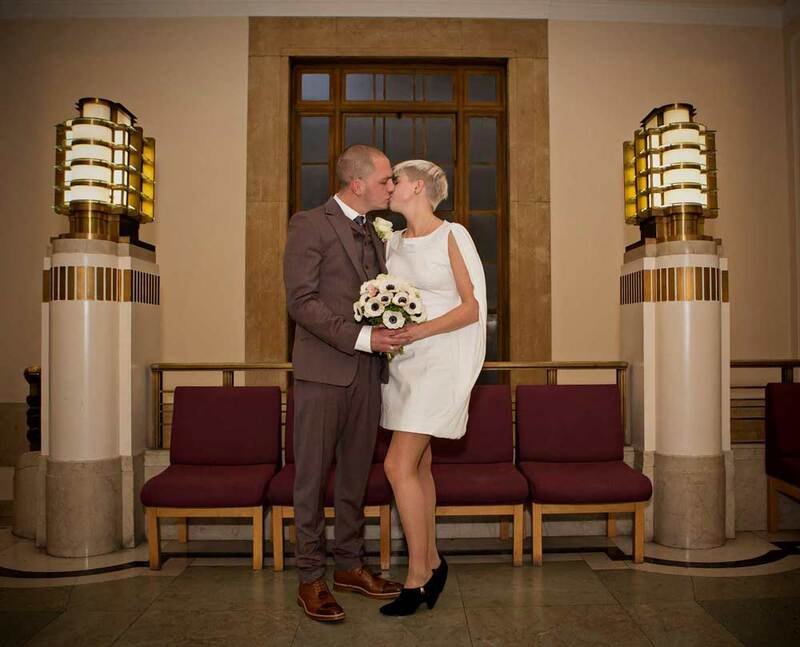 A love filled ceremony followed in the impressive and imposing venue that is Hackney Town Hall. Because of the lateness in the day confetti throwing and all group and family shots took place in the dark, which was atmosheric and no problem light wise when you know what you are doing photographically. A routemaster bus took us all to an art gallery in Hoxton fashioned underneath a railway arch that was specially converted for the reception. The driving team behind the routemaster “experience” will remain nameless because it was one of the craziest/almost dangerous pieces of driving we have ever witnessed from a bus at a wedding! We’ve also had to travel with them again recently…Having said that it made the journey very memorable and very amusing for most of the guests. We stopped off at a bridge on the way to recover (ha!) 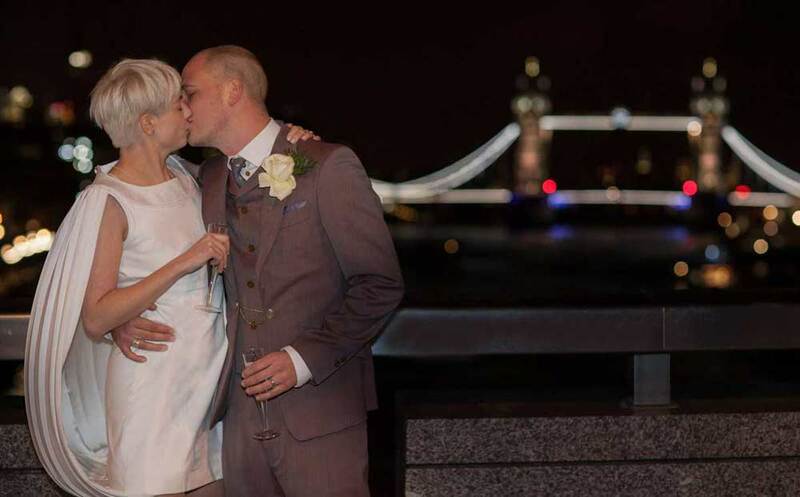 and to create an image back drop of one of the couples favourite spots Tower Bridge. After a little reception time Joanna and myself went walking with the newly weds to explore the night streets of Hoxton. Nothing was pre planned for this rwenty minutes or so apart from an area of corrugated iron Carly and Jim particualrly wanted to feature as a backdrop. 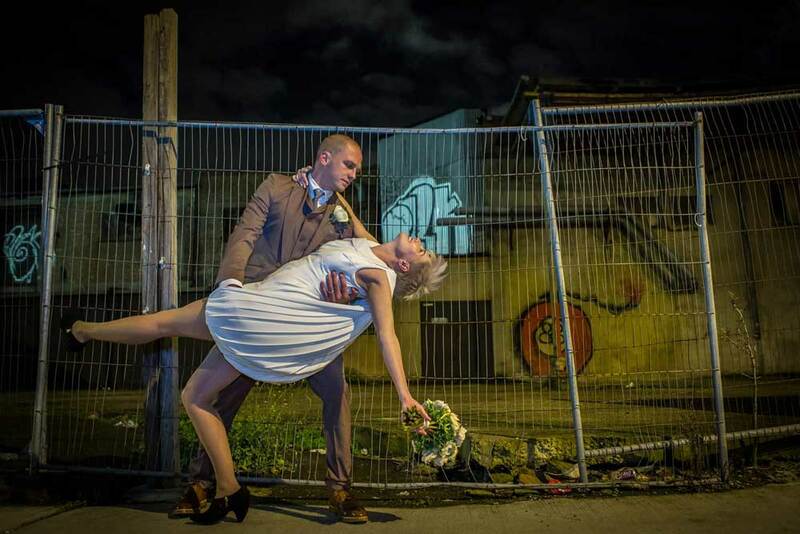 We basically just had a lot of fun looking for what interested us all for some memorable London wedding photos. The entire wedding party had the most delicious pizza based evening meal, hand made by a mobile fired oven facility parked outside the art gallery for the night. Lovely couple, lovely evening, pleae check out their website and some of their work at: One Penny Piece.